"There is something in our self-destructive personalities that cries for failure." "Poor me; woe is me; look at me, my life is such a mess! I've fallen, and no matter how hard I try, I continue to fail." Many of us came to NA singing this sad refrain. Life isn't like that anymore. True, sometimes we still stumble; at times we even fall. Sometimes we feel like we can't move forward in our lives, no matter how hard we try. But the truth of the matter is that, with the help of other recovering addicts in NA, we find a hand to pull us up, dust us off, and help us start all over again. That's the new refrain in our lives again. No longer do we say, "I'm a failure and I'm going nowhere." Usually, it's more like, "Rats! I hit that same bump in the road of life again. Pretty soon I shall learn to slow down or avoid it entirely." Until then, we may continue to fall down occasionally, but we've learned that there's always a helping hand to set us on our feet again. Just for today: If I begin to cry failure, I shall remember there is a way to move forward. I shall accept the encouragement and support of NA. When I was still using, I used to feel that way. As though there's no life for me anymore. I sort of lost hope with nothing to look for in the future. So, I kept on using. Sometimes I wished I could just die. I felt so tired of living, living life with the same old routine every single day. Day in and day out I lead the same kinda life. The first thing that I thought about whenever I opened up my eyes was drug - where was I going to get it (to score) or where was I going to get the money to buy it?Recovery is a healing process from which I am emerging stronger and more able to face the tasks ahead of me. It is sad that we must pass through such hell before reaching the serenity of peace of mind in recovery. Do you know that it took quite some times before I admitted I was a drug addict. I've used, misused and abused drugs and still I did not consider myself an addict. All through it all, I kept telling myself, "I can handle it," or "I'm using it just for fun," or "I can quit any time that I want to!" Because I thought (it was misconceptions about the nature of addiction really) addictions are full of violence, street crime, dirty syringes and rehab centers. And I was not violence at all, I don't do street crime or used needle to get high and I certainly not going to any rehab centers nor jails! How wrong I was? Just the same, I never thought there was anything special whether it was Ramadan (fasting month) or Eid ul-Fitr? It was all the same to me. I still eat as usual during Ramadan and I don't bother to go to the mosque to perform Teraweh. To me every day is Eid ul-Fitr especially when I got enough money and drugs to stay high all day! No drug meant no Eid ul-Fitr. It was as simple as that. Only now (for the past five years actually) do I realized how wrong I've been. Ramadan and Eid ul-Fitr are special occasions. I admit for my lack of credibility and I certainly cannot go back to undo any of the damages that I have done. But with all the support I have in my life today, I intend to remain clean and sober for the rest of my life (one day at a time). To all my friends especially the Muslim, please accept my apology for every mistakes I made whether I realized it or not. Selamat Hari Raya! I dedicated this post to Ahmad Anon(ymous)), a fellow traveller. Selamat hari raya. Maap zahir batin. Hey Arahman, i wish you Selamat Hari Raya too! The journey of recovery is not easy but the answer is in the 12 Steps. I commend your understanding that a person does not have to do it alone. Thank You for your dedication at the end of the post. Things like this are totally unexpected; and it was a mixture of happiness and feeling touched when I saw my name mentioned below. All those Puasa and Raya spent when I was addicted ... YES, they were exactly as what you had mentioned and described here. There is special thing called "empathy" that others - no matter how sincere they are and how hard they try - will not be able to have. Those feelings of "emptiness", without any regard or value to Puasa or Raya ... if I had the money, then I would have the drugs. Which meant that "things were great" then. As long as the money and drugs last, of course. It has been a fulfilling read, on this second day of Syawal. Thank you again. 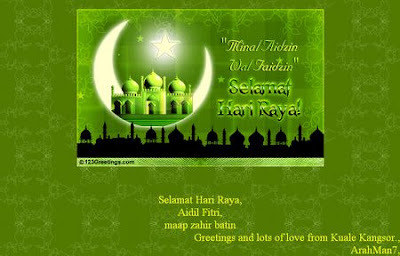 salam...slmt hari raya to u and bro Mc..from sherry and family,kuantan.